Four cottages set in a courtyard behind a beautiful Georgian house set in parkland on the side of Hampsfell outside Cartmel. Extremely well-equipped cottages, furnished to a very high standard. Pets welcome. Leisure facilities used are at Grange Hotel. Free wireless broadband. Children welcome from any age. 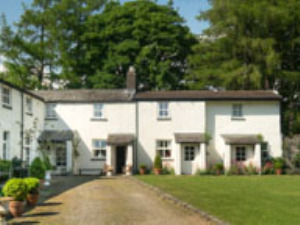 Longlands at Cartmel offers weekly bookings starting on Friday and short breaks of 3 days starting on Friday and of 4 days starting on Monday in some seasons. Spacious sitting/eating area with kitchen off and door to outside private patio. No room for cot in bedroom. Gamekeepers offers weekly bookings starting on Friday and short breaks of 3 days starting on Friday and of 4 days starting on Monday in some seasons. Groomsquaters offers weekly bookings starting on Friday and short breaks of 3 days starting on Friday and of 4 days starting on Monday in some seasons. In east wing of Georgian house with superb view over park from bedroom area. Small twin room and large double. Huntsmans offers weekly bookings starting on Friday and short breaks of 3 days starting on Friday and of 4 days starting on Monday in some seasons. One bedroom, can fit a cot too. Laundrymaids offers weekly bookings starting on Friday and short breaks of 3 days starting on Friday and of 4 days starting on Monday. From M6 jct 36 follow A590/A591 signed Barrow for 12 miles, where on reaching the summit of a steep hill and after passing under a footbridge, go down a road on the left signposted to Cartmel 3 miles. Turn left at the crossroads and left at the next junction. Go past Longlands Farm on the left towards Cartmel and you will soon see Longlands set back in the fields on the left about 0.5 mile from the road. 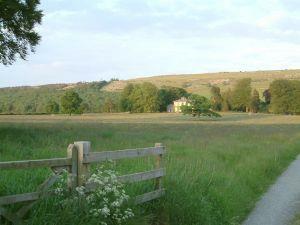 Turn left at the second entrance past Longlands farm, sign on the gateposts, and follow this drive to the main house. The cottages are in the courtyard behind the main house. Just what we want, dog friendly, relaxed and clean well equipped cottage. We have stayed many times and will continue to do so. Guest information is available in large print if requested.